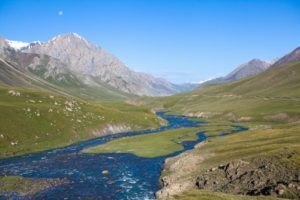 With a particularly mountainous terrain, Kyrgyzstan is a destination that should not be missed during a trip to Central Asia. It will delight eager hikers who will be thrilled to travel on horseback or on foot the Ala-Archa canyon, the Tian Shan massif and Lake Issyk-Kul. The latter is surrounded by various thermal springs and wellness centers to offer you a few moments of relaxation. The largest walnut forest in the world of Arslanbob is strongly recommended for treks. In addition to this natural diversity, Kyrgyzstan is inhabited by a very festive and welcoming people. They will be proud to share their nomadic culture with you, especially at major festivals such as ulak-tartych. Try and appreciate every bit of it! Before a trip to Kyrgyzstan, it is recommended to visit your travel doctor for advice as healthcare is unreliable in this country. The capital Bishkek offers public health centers with quality care like the Eldik Family Medecine Clinic, VIP Clinic or the German-Kyrgyz Medical Center. In more remote regions, medical facilities are either insufficient or nonexistent. Although the quality of medical products imported from Russia and other former member states of the Soviet Union is regulated, their supply is often limited. In order to access reliable pharmaceutical services, buy medication at Prestige (+996 312 621 462), Neman or Central Pharmacy. In order to call an ambulance, dial 103. Is Kyrgyzstan Safe for Travel? Do I Need a Visa to Visit Kyrgyzstan? Only a passport is required to enter Kyrgyzstan for trips under 60 days. Your passport must be valid for at least eight months beyond the date of departure. Please note that this is the website for the Canadian Embassy in Kazakhstan.